If you caught my haul video from Asia, you might remember this coat! I found it at a cute little boutique called bread n butter, and thought it looked very similar to the Chanel tweed jackets and coats I obsess over. While I won’t be getting one of those anytime soon, I can satisfy my love for sophisticated tweed with this pretty coat. 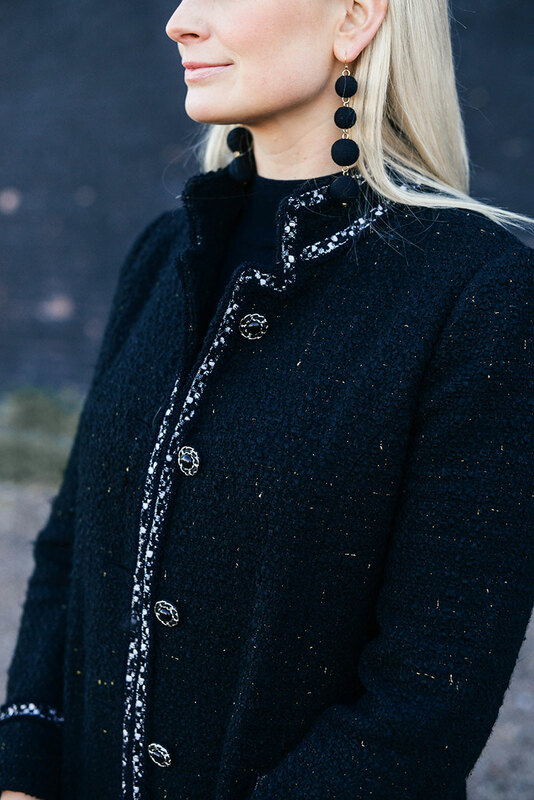 In addition to the cool chain buttons, this coat features a metallic, silver, white and black trim, and the coat itself is specked with gold. It’s a more glamorous topper for nighttime, don’t you think? I love that this coat elevates my day-to-day leggings and jeans, but you could definitely wear it with a black dress for date night! I found this for just under $300, and I feel like that was a pretty good deal for how gorgeous this coat is. While this particular coat isn’t available online, kate spade new york has a VERY similar look. It’s a slightly different style, but the sparkle tweed is all there! Something else new I want to share is this pair of Isabel Marant boots. You guys know how much I love my Rag & Bone boots – I’ve had them forever, and wear them constantly! I actually have them in three different colors – my commitment to them is a little absurd. With that said, I sort of wanted a dressier option, and I stumbled upon these higher-heeled ankle boots on sale! The ankle shaft is a little higher, which makes tucking in my jeans and leggings a breeze. The thicker heel keeps me walking steady and comfortable, but the added inches give me some height and looks a touch more stylish than my everyday Newbury boots. They come in leather, but because all of my Rag & Bone boots are leather, I thought it would be nice to mix things up with the suede pair. If you prefer a little color, try this olive pair or this tan/brown boot. Same style, so many options, and did I mention all four pairs are on sale?! Done and done. 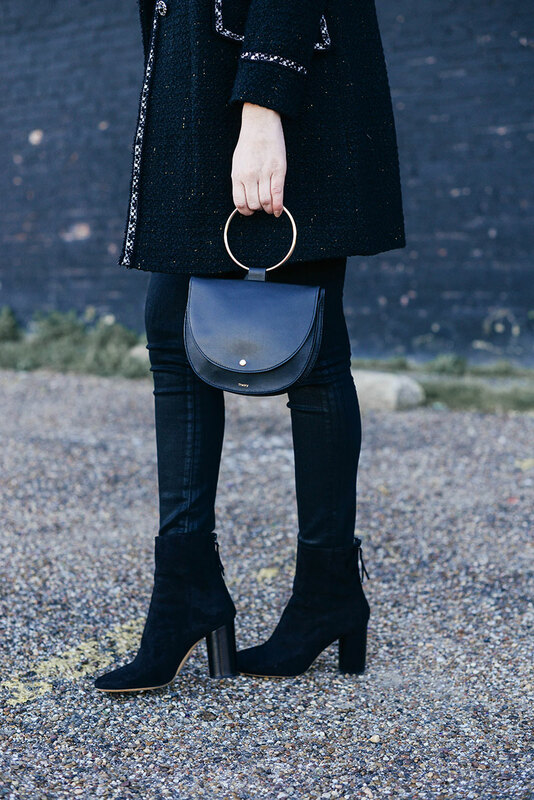 PS – this bag is back in stock in black!! Woohoo! Don’t let it get away – it’ll sell out again fast. Love this all black look, your boots are stunning. Love the all black outfit! That tweed jacket was such a great find! So classic (per usual). Love the details on that jacket! Love, love, love this handbag and have seen it worn by a few other of my favorite fashion bloggers but the price is out of my budget. Any suggestions for something more budget friendly? Love love your earrings! I have the same pair in pink from Design Darling!